The O'Neill Brothers were invited to play for George and Barbara Bush at the annual Points of Light Awards Banquet on March 8th at the Marriott Marquis Hotel in New York City. 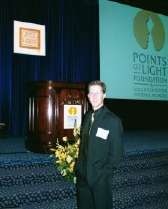 The Points of Light Foundation is a volunteer organization set up by George and Barbara Bush when they were in the White House 12 years ago. The Foundation's mission is to engage more people more effectively in volunteer community service to help solve serious social problems. 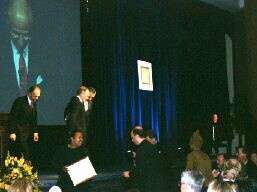 George H. Bush, second from left. Tim O'Neill in right-hand corner. 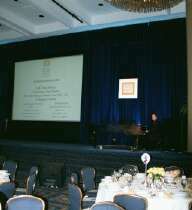 The luncheon was beautifully decorated in the Broadway Ballroom of the Marriot Marquis Hotel. Tim O'Neill entertained George Bush and the guests of the eight corporations (Cargill, 3M, EDS, Legacy Health Systems, Lowe's Home Improvements, Ricoh Electronics, Washington Mutual, and MTV Networks) that were receiving awards from the Points of Light Foundation. (When George Bush spoke, he mentioned that Barbara was back at home for the weekend and unable to attend.) As a gift from the O'Neill Brothers to everyone in attendance, each person received a copy of the O'Neill Brothers' "Through the Years" movie themes CD. During the two hours of playing piano music, Tim wished that he would have learned a few songs particular to the 'Lone Star' state. Instead, he played through many of the songs on their collection of CD's. Maybe Tim and Ryan can learn the 'Texas' songs if the O'Neill Brothers are asked to perform for George W. in the White House. Hopefully they'll be playing 'The Yellow Rose of Texas' soon! Tony DeMasi, a friend of the O'Neill Brothers, is the Executive Director of the National Tabletop & Giftware Association. He is well acquainted with the Points of Light Foundation and knew that they were looking for music during the welcome and the dinner portion of the awards banquet. Much to the delight of the O'Neill Brothers, Tony recommended that the O'Neill Brothers be invited to entertain George and Barbara Bush and over 600 guests at the banquet. After review by the Foundation, the O'Neill Brothers were invited to share their talents at the annual awards event. The only problem was that Ryan was scheduled to perform in California on that day, and Tim was scheduled to be in the recording studio in Minneapolis working on their new wedding CD! Knowing that this invitation to perform was an honor, Tim and Ryan decided that Ryan would still play the scheduled event in California, and that Tim would fly to New York for the day to represent the music of The O'Neill Brothers. Tim O'Neill standing in front of the stage.